Inspiring Art Teachers to Explore Art History | Curator’s Corner: Guess Who? As a painter myself, I find it fascinating to watch a famous painter’s progress from early to late work. In the case of Edgar Degas (1834–1917), I’m always over the top because he is one of my idols as a painter. Just like Monet (1840–1926), he continued to grow as an artist throughout his life. His earliest works are totally in the realm of Realism. Although, I must say, his realist works are forward looking, unlike the stale, academic works of the artists under which he studied. 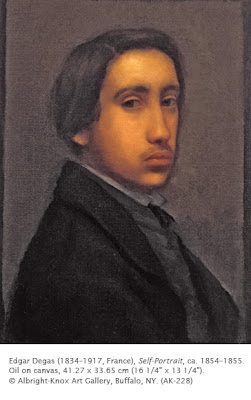 Please enjoy this self-portrait; I think it will give you a different perspective on Degas’ work. Goodness knows it busts the perception that Degas painted nothing but ballerinas under lit by the footlights on stage! With this painting, we’re not talking about Degas as an Impressionist. Although he initially went to school to study law, Degas eventually studied art at the École des Beaux-Arts in Paris, a conservative institution. While there, his major influences were the academic realist Jean-Auguste Dominique Ingres (1780–1867) and the romanticist Eugène Delacroix (1798–1863). From Ingres he learned expressive line while learning expressive color from Delacroix. He also studied in Italy, his father’s homeland, where he encountered the French symbolist Gustave Moreau (1826–1898). This portrait displays everything that Degas learned from Ingres, while infusing it with the dramatic lighting of the Romanticism painters. It displays the conservative, academic palette (green-yellow-brown) in which he was trained, so different from the Impressionist palette that most of us are used to seeing in his work. It also displays the influence of Spanish and Dutch Baroque painting that greatly influenced Degas’ early work. The pyramidal, balanced composition is totally in keeping with Renaissance and Baroque portraiture, especially self-portraits of Spanish Baroque artists such as Velázquez. Although Degas has depicted himself in a serious, almost dour attitude, the viewer is drawn to the portrait for its honesty and forthright outward stare. It is not the dull, generalized stare of Renaissance or Baroque portraits. To me, this self-portrait exudes all of the intensity of Degas’ personality. Degas never partnered with anyone because he thought it would be a distraction from his artwork. This early work shows his affinity for Dutch and Spanish Baroque painting. However, by 1868 he was fascinated by the paintings of Édouard Manet (1832–1883), a realist who turned toward the Impressionist palette in the 1870s. Activity: Drawing a portrait emphasizing light and dark. Degas emphasized his long nose and small chin in his self-portrait. Draw a self-portrait that emphasizes particular features of the face regardless if it is realistic or not. Using dark-colored construction paper, draw a self-portrait using light colored chalks or colored pencils to emphasize the light-struck surfaces of the face, body, etc.